In fact, graphene is nothing but a large, unrolled carbon nanotube, and the two materials share many qualities, including strength and conductivity. Though promising, nanotubes have proved devilishly difficult to assemble into circuits. Nanotubes don’t readily connect to one another, and attaching them to metal contacts creates spots where electrons tend to scatter, dissipating energy as heat. Graphene circuits could in principle work efficiently even with components measuring only a few atoms across—scales that can’t be achieved with ordinary semiconductors. In recent months, scientists have learned how to make graphene-based transistors and diodes—the basic elements of computer chips. And they have begun trying to connect graphene to other materials, including carbon nanotubes. But that’s only a beginning. If graphene is to replace silicon one day, scientists and engineers will have to figure out how to manufacture large numbers of circuits with nearly atomic precision. Geim’s adhesive tape stratagem could hardly be the basis for a new chip-fabrication plant, but it continues to be researchers’ favorite way of making graphene for experimentation. Anyone who uses a pencil is likely to leave some single-layer graphene flakes scattered on paper, he says. The graphene sheets in graphite are bound to one another only by weak electrostatic forces. That’s why pencil lead is so soft. After gently rubbing graphite on a silicon-oxide crystal, Geim stuck strips of tape on the carbon debris, hoping that when he peeled off the tape, thin stacks of a few graphene sheets would stick to it. To further pry apart the sheets, he repeatedly folded the pieces of tape, sticky sides together, and peeled them open again. Then, by dissolving the tape in a solution, he let the graphene flakes settle onto the surface of a silicon-oxide crystal. Through an ordinary microscope, Geim spotted graphene stacks of varying thicknesses stuck to the crystal’s surface. The translucent flakes created rainbows of colors “like oil on the surface of a rain puddle,” he says. With a bit of experience, Geim learned how to recognize single sheets by their colors. “If it’s blue or red, you know it’s thick,” he says. To find single layers, “you look for another shade of purple” (Science News: 10/23/04, p. 259; and 8/13/05, p. 110). To confirm that they had actually found single sheets of graphene, Geim and his collaborators tested how the flakes conducted currents. Measurements showed that electrons were able to travel microns—enormous distances by atomic-scale standards—without bumping into atoms. These findings confirmed crucial predictions about single-layer graphene. In graphene sheets, as in carbon nanotubes, each carbon atom binds strongly to three neighboring atoms, creating a web of hexagons resembling chicken wire. In addition, the atoms form bonds by sharing electrons from barbell-shape orbitals that are perpendicular to the chicken wire plane. These sideways orbitals fuse with their neighbors, creating veritable electron superhighways above and below the graphene plane. In 2005, Geim and his colleagues made another important discovery. Placing graphene samples in magnetic fields whose intensities the researchers ratcheted up, they saw the electrical resistance increasing in discrete steps, a phenomenon known as the quantum Hall effect. Around the same time, a group led by Philip Kim of Columbia University made the same discovery after learning of Geim’s tape-peeling technique. Obscure as it may sound, the quantum Hall effect was what sparked the physics community’s interest in graphene. “It put an enormous spotlight on the field,” de Heer says. That’s because the resistance steps produced by the effect had a pattern peculiar to graphene, so it convinced scientists that the new material really had “quite unique physics,” Kim says (Science News: 11/12/05, p. 309). The effect implied that the electrons move in graphene’s conduction superhighways unlike the way they move in any other conductor. In a piece of metal, electrons that carry current act like gas particles, jittering mostly at random and moving faster the more energy they have. In graphene, on the other hand, conduction electrons tend to move in lockstep as a single quantum entity. Like photons, the swarms of electrons move at the same speed, regardless of their energy. Graphene’s uniqueness makes it an intriguing playground for physicists and materials scientists. Researchers say that it could even inspire new ways to manipulate information. Meanwhile, several teams are working on shaping graphene into transistors and other traditional electronic components. Because electrons in graphene move at high speeds, graphene-based transistors could in principle switch currents on and off faster than semiconductor-based transistors do. Like carbon nanotubes, graphene is an excellent conductor of heat, so graphene chips could stay cooler than silicon chips. But the feature that makes graphene most appealing to scientists is its toughness. “The graphitic bond—the carbon-to-carbon bond—is the strongest in nature,” even stronger than the bonds between carbon atoms in diamond, says de Heer. That strength gives graphene its remarkable stability, and means that graphene circuits could in principle be miniaturized to sizes of a few nanometers without falling apart. By contrast, molecular-scale circuits made of silicon or other materials would quickly fail. “All other materials oxidize, decompose, move around, or melt,” Geim says. Furthermore, conventional transistors are made from silicon or another semiconductor that has been “doped” to modify its electronic properties. In negative doping, addition of a small amount of another element increases the number of current-carrying electrons. In positive doping, addition of a different element creates gaps in the electron distribution, which move around like positively charged carriers of currents. At nanometer scales, it becomes almost impossible to dope a material uniformly because the dopant atoms are so few and far between. These limitations mean that individual features in silicon chips, already as small as 65 nm and with 45-nm technology in the offing, will probably reach their smallest possible size within 10 to 15 years. Future graphene-chip technologies, meanwhile, could borrow many of the methods already used for creating silicon chips. Chip production uses a top-down approach, which starts with large sheets of crystalline silicon and uses sophisticated lithography techniques to etch circuitry into them. “In principle, the processing technology could work exactly the same” for graphene, says Pablo Jarillo-Herrero, a physicist in Kim’s lab at Columbia. Jarillo-Herrero is one of several scientists who are seeking ways of chiseling narrow strips, called nanoribbons, out of graphene sheets. He has made nanoribbons as narrow as 20 nm across but says that it could take years to bring their width down to less than 10 nm. Because the hexagonal rings are about 0.2 nm in diameter, it gets harder to control the shape of a nanoribbon’s edges as the structures become narrower. Irregular edges would “suppress part of the unique properties of graphene,” says Jarillo-Herrero. A more immediate goal is to make a field-effect transistor (FET) from graphene. FETs are the bread and butter of silicon chips. In a typical FET, a slice of negatively doped silicon is sandwiched between two pieces of positively doped silicon. In the transistor’s off state, no current flows because the middle section acts as an insulator, but applying an electric field to the middle layer turns it into a conductor, switching the transistor to on. For graphene, the equivalent of doping is applying an external field that increases the local concentration of charge carriers of one type or the other. In a prototype graphene FET, a nanoribbon links two graphene sheets. An insulating layer is deposited on the structure, and electrodes lying just above apply controlling fields. In an alternative design demonstrated this month by the Columbia team, the electrodes and the nanoribbon lie side by side, carved out of the same graphene sheet. The narrowness of a nanoribbon alters its electronic properties so that its conductivity is normally low. Applying an electric field sharply increases its conductivity, a team of Jarillo-Herrero’s Columbia colleagues reported in the May 18 Physical Review Letters. The nanoribbon thus acts as the middle layer of a conventional FET does, allowing the device to be turned on or off. In an upcoming Physical Review Letters, Jarillo-Herrero and his collaborators at Columbia and at the Massachusetts Institute of Technology describe their first steps toward making nanoribbon-graphene transistors. Charles Marcus of Harvard University and his collaborators independently describe a similar achievement in the Aug. 3 Science. Still, graphene electronics is far from proved as a viable candidate for the postsilicon era. As yet, graphene transistors are slower than silicon ones and much slower than transistors made with competing materials such as carbon nanotubes. The best way to control graphene at the molecular scale may be through chemistry. In de Heer’s vision, engineers might someday insert atomic-scale components into carbon-based electronics by synthesizing molecules and attaching them to an etched template. This would combine the top-down method used in silicon-chip technology with a bottom-up approach of assembling components piece by piece. De Heer says that his team has already succeeded in connecting two sheets of graphene with a carbon nanotube. In addition to nanotubes, polycyclic aromatic hydrocarbons or other organic molecules also have orbital structures that could merge seamlessly with those of graphene, de Heer says, making them ideal molecules for integration into graphene circuits. Most experts caution that graphene research remains in its early stages. No one is ready to make promises, especially in light of the experience with carbon nanotubes. “Carbon nanotubes promised so much and so far [have] delivered so little, and we should naturally be cautious about promising too much for graphene,” Geim says. 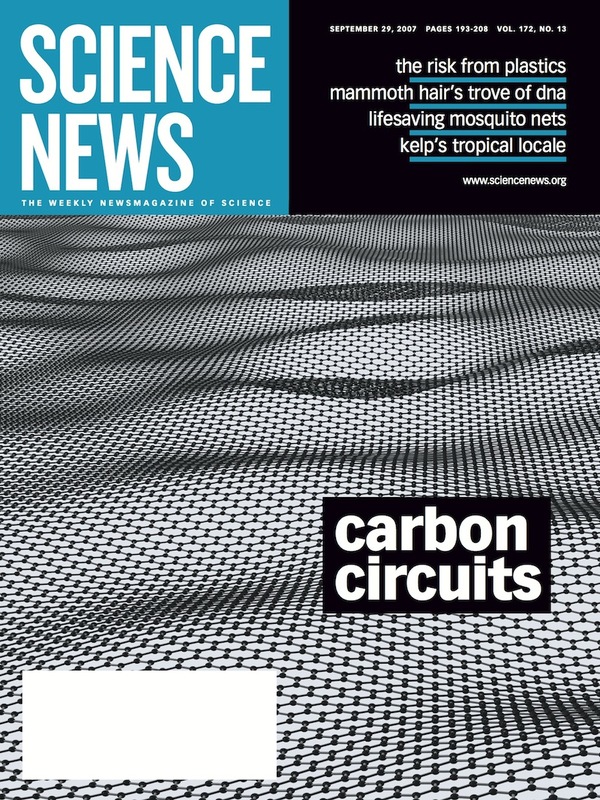 Cees Dekker of Delft University of Technology in the Netherlands, who a decade ago created the first nanotube transistor (Science News: 5/9/98, p. 294), says that scientists’ excitement about graphene gives him a feeling of déjà vu. “Sometimes, people are enthusiastically rediscovering the properties of graphene which were already heavily discussed 10 years ago in conjunction to nanotubes,” he says.